The present report was developed and is based on study results prepared by experts, academics, scientists and researchers from the United States, Canada, Australia, Great Britain, Denmark, Germany, Poland and Russia, who have collaborated together for the past three years with the Parliamentary Committee for investigation of the Polish Air Force One crash in Smolensk, Russia on April 10, 2010. Research study prepared by author Kazimierz Nowaczyk, Ph.D.
On April 10, 2010, the Polish governmental flight performed by Tupolev Tu-154M airplane (“Polish Air Force One”) departed from Warsaw, Poland, to Smolensk, Russia. The plane carried a highest level delegation from the Republic of Poland travelling to commemorate the 70th anniversary of the Katyn Forest Massacre. Polish Air Force One crashed near the 'Severny' airport in Smolensk, Russia at 10:41:06 local time on the same day. There were no survivors; all 96 people on board were killed in the incident (“Smolensk Crash”). The official delegation consisted of the President of Poland, the First Lady, the entire General Army Command of the Armed Forces of the Republic of Poland, the President of the National Bank of Poland, members of parliamentary and government officials as well as family members of the Katyn victims, including a U.S. citizen. Among the ten generals of the Polish Armed Forces who perished in the Smolensk Crash, five had served as top NATO commanders, including Gen. Franciszek Gągor, the next in line to have had assumed central command of NATO forces in Europe. Furthermore, the following Polish generals, supporters of the US military missions in Iraq and Afghanistan, were killed in this tragedy: Gen. Andrzej Błasik, Gen. Tadeusz Buk, Gen. Bronisław Kwiatkowski, Gen. Włodzimierz Potasinski, Gen. Tadeusz Płoski. 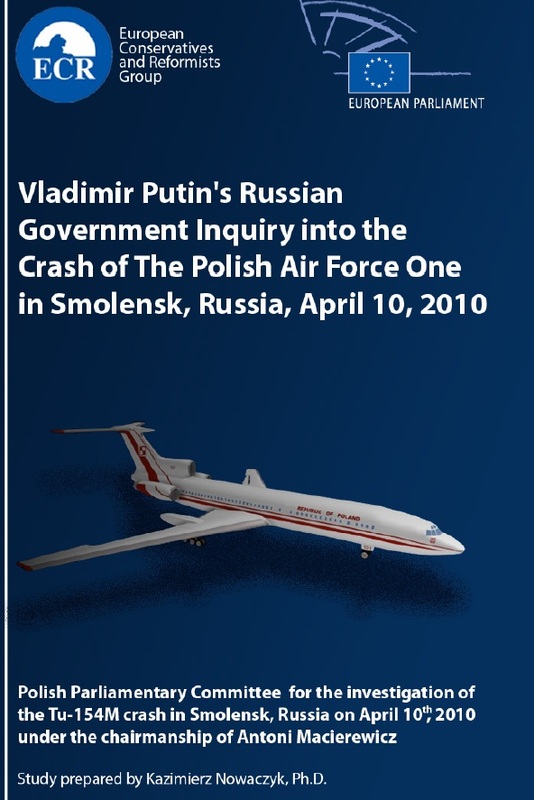 The present report was developed and is based on study results prepared by experts, academics, scientists and researchers from the United States, Canada, Australia, Great Britain, Denmark, Germany, Poland and Russia, who have collaborated together for the past three years with the Parliamentary Committee for investigation of the Polish Air Force One crash in Smolensk, Russia on April 10, 2010. The report focuses on the official Russian report of the Russian Interstate Aviation Committee (Miezgosudarstwiennyj Aviacyonnyj Komitet - IAC) (‘Final Russian report’) which assumed responsibility for the investigation of this crash upon an executive order by the National Investigation Committee headed by Prime Minister Vladimir Putin. Putin directly oversaw the initial investigation during its first 72 hours and maintained control of the investigative process until January 2011, nine months after the crash. On April 13, 2010, the Russian National Investigation Committee rejected an assistance offer from the European Union experts. Vladimir Putin has failed to sign the IAC report to this day. Most significant technical findings referred to in this document have been presented and approved by experts during three annual scientific conferences dedicated to the Smolensk Crash, which took place in Warsaw, Poland in 2012, 2013 and 2014, as well as at a public hearing in the European Parliament on March 2012, in articles in peer-reviewed scientific journals and in Polish Parliamentary Committee Reports. Each section of the present report contains examples of the most significant errors and violations of investigation standards described in the International Civil Aviation. Organization (ICAO) “Manual of Aircraft Accident and Incident Investigation”, cases of evidence destruction or alteration as well as manipulation of conclusions contained in the Russian (IAC) Final report. All findings cited herein have been published by the Polish Parliamentary Committee for the Investigation of the Smolensk Crash. This document contains information on the errors, omissions, mistakes and deliberate distortions in both the report issued by the Interstate Aviation Committee (MAK) and the investigation into the disaster. The list may be incomplete, as new information on the MAK’s errors comes to light every day. In March 2014, for example, it emerged that General Błasik’s blood tests had been falsified by Russia. From the very beginning, as the aircraft made its descent, the crew was given incorrect information by air traffic control. Personnel in the air traffic control tower in Smolensk North Airport were receiving orders from Moscow, contrary to Russia’s air traffic rules. The air traffic controllers were being given instructions by Colonel Krasnokutsky, who was present in the tower – even though he did not have the appropriate authorisation. Colonel Krasnokutsky himself was receiving orders from an unidentified source within the Russian military command, a source he referred to by the code name ‘Logic’. The air traffic controllers were told in no uncertain terms not to close Smolensk North Airport, and no alternative airport was suggested. ‘Logic’ also told the controllers to guide the plane down to the decision altitude of 100 m.
In spite of this incorrect information, the crew of the TU-154M did not try to land, but initiated a go-around procedure. At the time of the disaster, the aircraft had already begun climbing, and was flying far above the birch tree the MAK has blamed for the crash. Huge oscillations as the plane was accelerating upwards and the tilt recorded by the black boxes a few seconds before the plane was destroyed are important clues in the search for the truth behind the tragedy, which was caused by the aircraft exploding mid-air. The aircraft was broken into more than 60 000 pieces. These fragments were later found and catalogued by a team of archaeologists from Poland. They were scattered over an area of more than 1.5 km. The rescue operation was seriously delayed and, after a premature and unfounded declaration that ‘there were no survivors’ was issued long before any bodies had been found, turned into a recovery operation. Notes from the subsequent autopsies clearly show that the medical reports drawn up were of an unacceptable standard: for example, a ‘joint’ cause of death was declared, without giving any details of the condition each body was in. With the Polish Government’s consent, the Russian authorities followed the protocol in Annex 13 to the Chicago Convention of 1944, under which responsibility for the investigation lies with the State of Occurrence (the country the accident took place in). This made it very easy for investigators to manipulate and tamper with evidence. The procedures which should have been followed, under the Polish-Russian agreement signed in 1993, which set out the rules for investigations into cases involving military aircraft, were disregarded. The MAK made up its own version of events, saying that the Polish crew, under pressure from the drunken Polish air force commander and the frightened President Kaczyński, decided to land in the fog. The aircraft descended too quickly and – at about 5 m above the ground – clipped a tree with its wing, ripping off part of the left wing and turning the aircraft upside-down. The plane hit the ground upside-down, killing everyone on board instantly. - tampered with black-box data (there were six different copies of the cockpit voice recordings, faint lines on the graphs and clear discrepancies between recorders which had been linked together). - ignored the evidence given by Universal Avionics, cited in their own report, that a total power failure had disabled the flight monitoring system (FMS) at a height of 15 m.
Given that the Russian authorities have still not handed over the aircraft wreckage or black boxes to Poland, the investigation into the disaster has been difficult and time-consuming. In spite of this deliberate obstruction, however, independent experts and scientists have pulled together information from the relevant documents (some of which had been hushed up) and carried out analyses and simulations of their own in an effort to determine the most likely and coherent sequence of events, which is presented in Chapter 1.2 of this document and documented in Chapter 6 and Annex XII. - While the aircraft was carrying out a go-around procedure far above the birch tree (900-1000 metres above the start of the runway), the tip of its left wing was destroyed by an explosion. - Another 200-300 metres further on, the wing suffered further damage and the tip was blown off, causing severe turbulence, a change in its magnetic course and loss of altitude. - Even before the plane hit the ground, a powerful explosion in the fuselage pulled the aircraft apart (the rear end of the fuselage broke off along with the engines; the sides of the aircraft were ripped off) and killed most of the passengers. - Finally, there was an explosion in the President’s cabin after the aircraft had hit the ground. The blast scattered fragments of the cabin (doors, sofa, a fragment of the fuselage with a window) across a radius of 30 metres perpendicular to the direction the plane had been travelling in when it hit the ground. The fragments showed clear signs of having been subjected to high temperature and pressure. - the FMS records which show that the power supply failed at a height of 15 metres. - traces of explosives on the wreckage. The death of President Lech Kaczyński and the heads of the Polish army, navy, air force and special forces has seriously weakened Poland’s defence capacity and its potential as a member of NATO. The failure on the part of Member States and international opinion to react to the events has made it easier for Putin to prepare a military attack on Ukraine.